I found this on a blog (don't remember where). Enjoy the punch in the stomach. Worshipers of God prioritize God’s glory and pleasure in worship. 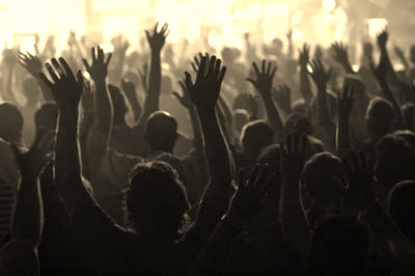 Worshipers of worship prioritize “being fed” in worship. Worshipers of God care less about their personal preferences in worship. Worshipers of worship care intensely about their personal preferences in worship. Worshipers of God are more easily blessed in worship. Worshipers of worship are more easily bothered in worship. Worshipers of God approach worship as instruments and vessels. Worshipers of worship approach worship as appraisers and evaluators. Worshipers of God tend to approach their pastors and worship leaders more often with words of encouragement and thankfulness. Worshipers of worship tend to approach their pastors and worship leaders more often with words of criticism and admonishment. Worshipers of God more instinctively flex when elements are out of their comfort zone. Worshipers of worship more instinctively bristle when elements are out of their comfort zone. Worshipers of God are inspired by beautiful art to love God more. Worshipers of worship are inspired by beautiful art to love beautiful art more. Worshipers of God easily overlook and forget glitches and “errors” that happen in worship. Worshipers of worship fixate on and can’t get past glitches and “errors” that happen in worship. Worshipers of God tend to leave a “good” worship service loving God more. Worshipers of worship tend to leave a “good” worship service loving worship services more. Worshipers of God tend to leave a “bad” worship service loving God more. Worshipers of worship tend to leave a “bad” worship service bothered. Worshipers of God tend to leave worship with a renewed sense of awe and thanksgiving. Worshipers of worship tend to leave worship ready to dialogue about what worked and what didn’t.